Giving chocolate to a loved one on Valentine’s Day to show affection is ingrained in modern culture, but there was a time when people looked at chocolate as a medicine. Because of this, the National Library of Medicine has a number of old and rare books on chocolate as a remedy for all sorts of disorders. 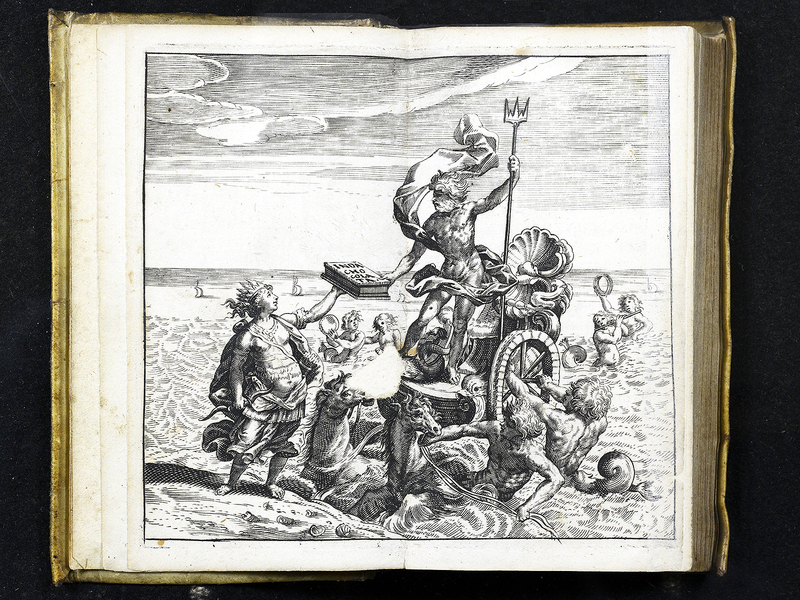 Poseidon taking chocolate from Mexico to Europe in Chocolata inda by Antonio Colmenero de Ledesma, 1644. Meso-American civilizations such as the Maya and Aztecs in what are today Mexico and Central America invented and cherished a chocolate drink made of their native cacao plant long before Europeans arrived in the fifteenth and sixteenth centuries. Christopher Columbus and his son Fernando first saw the beans in a canoe during Christopher’s fourth voyage to America in 1501, and conquistador Hernán Cortés popularized it when he returned with the drink to Spain in 1528. By the late 1500s, chocolate had become extremely popular among aristocrats and the imperial court in Spain, and physicians were beginning to take sides on whether it was healthy or unhealthy. One challenge relating to foods discovered in the New World was to fit them into the contemporary European system of health and well-being, the humoral theory, which held that disease was caused by an imbalance in the body’s four humors (blood, bile, black bile, and phlegm) and the four qualities of hot, cold, dry and wet. The chocolate bean itself was thought to be cold and dry, so when used medicinally it was often applied to ailments that were thought to result from an abundance of heat and wetness, like fevers. The first book devoted entirely to chocolate, and touting it as a useful drug, was Spanish physician Antonio Colmenero de Ledesma’s Curioso Tratado de la Naturaleza y Calidad de Chocolate (Curious Treatise on the Nature and Qualities of Chocolate), published in Madrid in 1631. He warned that because it was cold and dry, however, its excessive use could cause a buildup of black bile, which could cause melancholy. Others pointed out that the solution was to heat the chocolate and mix it with ingredients like chilies, anise seeds, or corn flour, depending on the patient’s temperament. 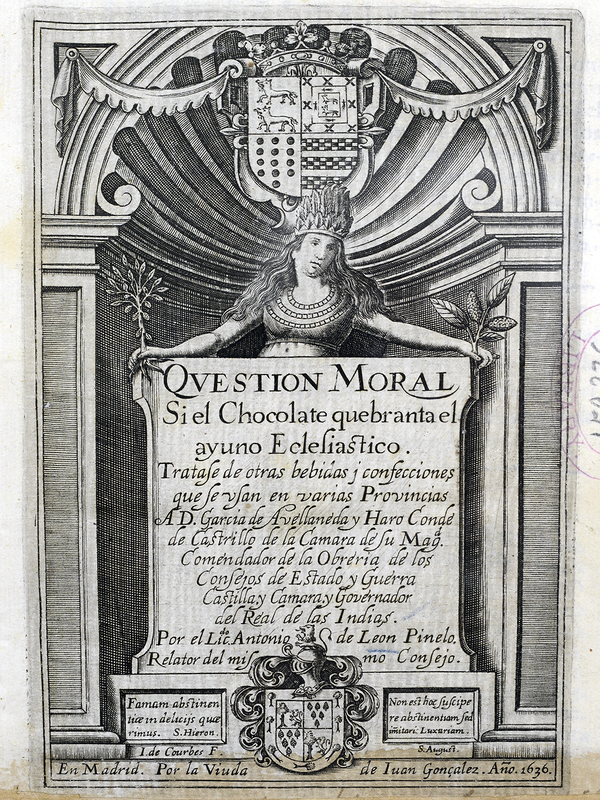 Antonio de León Pinelo had a different take on chocolate and believed that drinking it on ecclesiastically prescribed fast days was morally suspect, as he stated at length in his book, Question Moral Si el Chocolate Quebranta el Ayuno Eclesiastico (Moral Question on Whether Chocolate Breaks the Ecclesiastical Fast) (Madrid, 1636). French authors took up the subject of chocolate along with two other exotic beverages that were also taking Europe by storm in the 17th century: coffee and tea. Nicolas de Blégny, surgeon to the Queen and physician to the King of France, recommended it to settle the stomach (when taken with syrup of vanilla), including stopping vomiting and diarrhea, but also as a remedy for venereal disease in combination with a host of other drugs. These remedies were described in his work, Le Bon Usage du Thé, du Caffé et du Chocolat pour la Preservation & pour la Guérison des Maladies (The Proper Use of Tea, Coffee and Chocolate to Preserve Health and Cure Illnesses), printed in Paris in 1687, in which he included illustrations of the cacao plant, the bean’s preparation, and even the “moulinets” used to stir the chocolate drink to make it frothy. A recent acquisition by the NLM suggests that chocolate was still a topic of discussion among trained medics into the early 1800s. Joseph Urreta wrote his academic dissertation in Lima, Peru, as a requirement to receive his medical degree in 1804 with the title, Sub Torrida Zona De Genitibus, Potio Indica Vulgo Chocolate, Saluberrima (Is the Indian Beverage Known as Chocolate Very Healthy for People Born in the Tropics?). Urreta’s dissertation advisor, Hipólito Unanue, was the most noted Peruvian physician of the day and later served as Peru’s Finance Minister in 1824 after the country’s independence from Spain. In the 1700s and 1800s, manufacturers discovered the art of creating solid chocolate. And in the 1860s Richard Cadbury, of the noted English chocolate-producing family, first put chocolates into heart-shaped boxes for Valentine’s Day and so associated it with the holiday and with the heart. 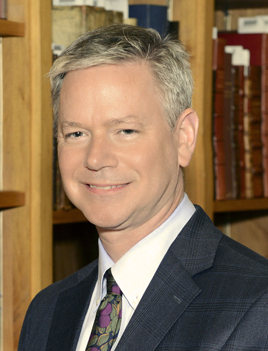 The National Library of Medicine has a large collection of books and articles relating to chocolate and its relation to human health. To learn more about them, please feel free to contact us at NLM Customer Support.